Hot on the heels of Eon announcing delays on Kingsnorth, climate activists gained another major victory this week as BAA bowed to anti-aviation opposition of a third runway at Heathrow Airport. 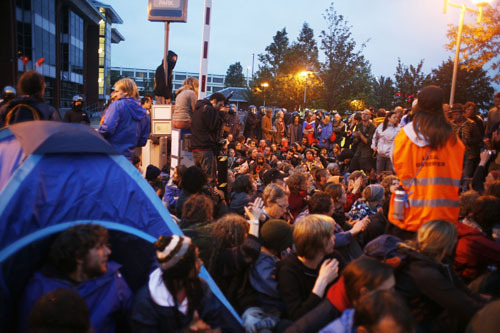 Following a seven year campaign, with a series of direct actions including mass action at Climate Camp 2007, the airport authority has said it will not yet be submitting a planning application to expand Heathrow. In an unusal twist, BAA stated thay would not apply for the third runway before the general election, due to the possibility of the Conservative Party forming the next government (who claim to oppose the expansion). In which case they said they would give up the fight. Emma Jackson, a spokesperson for the Climate Camp, stated: “E.ON and BAA know that the days of committing new climate crimes are over. Now we have to start shutting down existing coal-fired power stations, and that’s why we’re going to Ratcliffe-on-Soar next week.” Climate Camp is calling for renewable energy to replace coal fired stations. The role that the, long predicted, impact of peak oil on aviation played in this decision isn’t known, but last year Virgin Atlantic boss Richard Branson acknowledged peak oil. Now that airport expansion is dead, for now, it’s also time for an end to road expension.